One of the simplest secrets to beautiful design is ample and practical storage. Because, let’s face it, it doesn’t matter how nice your couch is if you can’t see it under piles of magazines or toys. Really great interior design is as much about how you feel in a space as what the space looks like. Today, there is an almost endless supply of creative storage solutions that are as beautiful as they are functional. 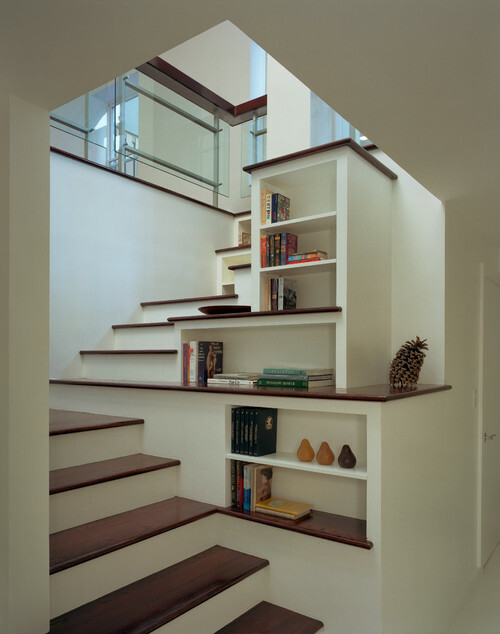 This first storage solution is, admittedly, limited to homes with at least two floors as it requires a staircase. What has typically been treated dead space – that area behind and under the stairs – can, with some imagination, double your storage space. 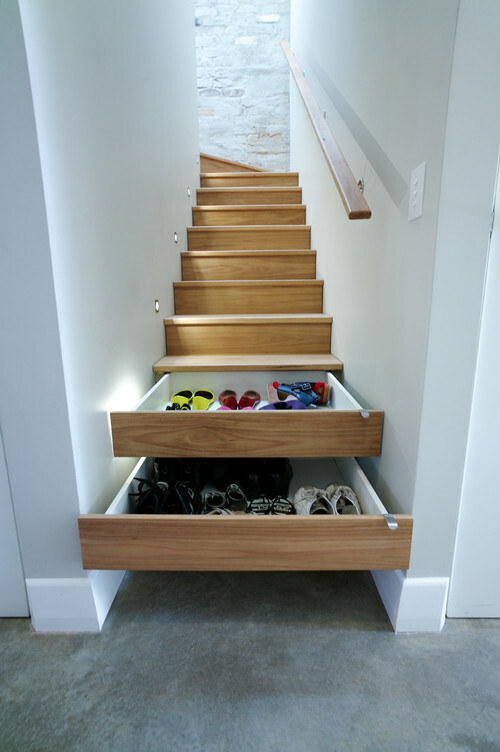 Both the sides and the stair steps themselves can house drawers perfect for shoe storage. 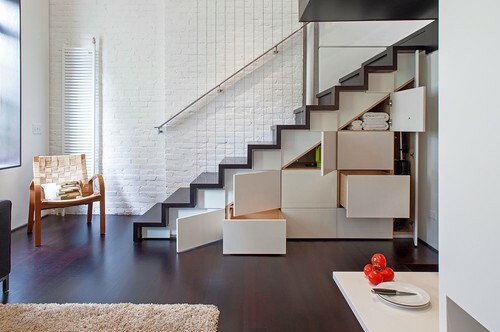 This modern loft’s staircase mixes and matches different storage sizes, making it perfectly versatile. In this transitional home, custom shelves nestled in among the flights of stairs creates a somewhat haphazard, but still elegant, visual detail. While we’re on the topic of overlooked spaces, one trick everyone can use is to think vertically. A mere foot or two of space can transform the storage options for small rooms. 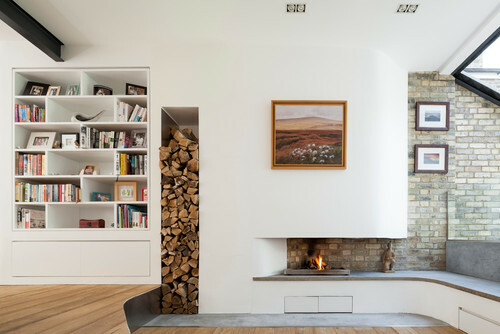 While this same fireplace and wood storage would still be beautiful if oriented horizontally, the vertical design makes it a show stopper. 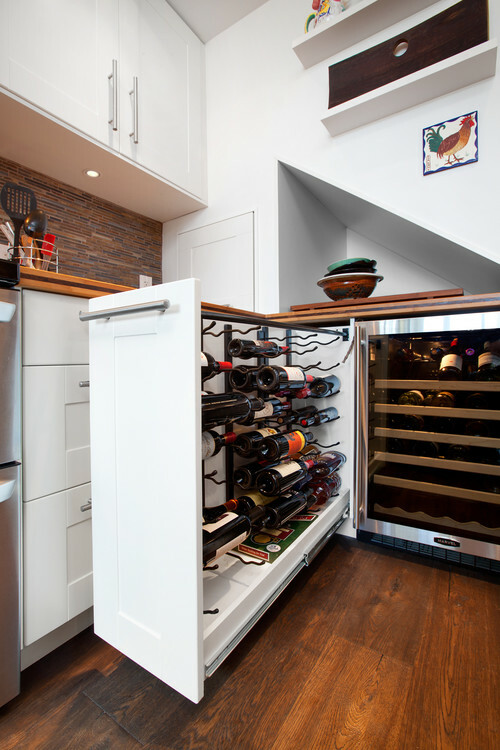 Dealing with a space where you can’t, or don’t want to, add traditional closed storage? Embrace your more beautiful belongings with open storage solutions. 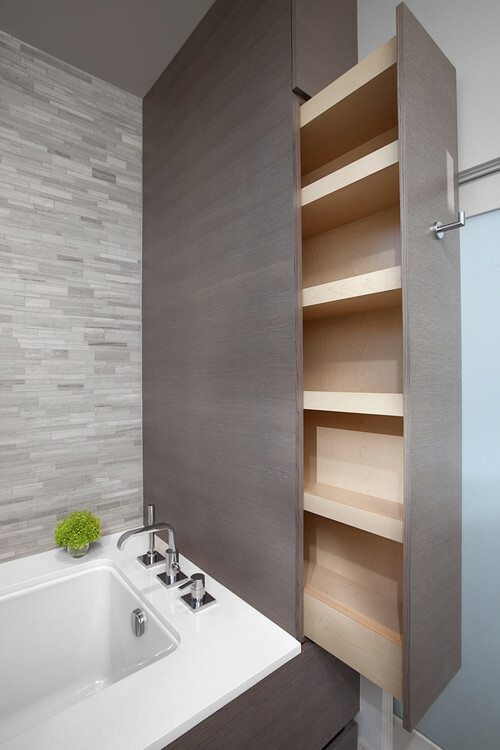 Floating shelves provide storage within reach of the soaking tub while also maintaining the open, airy feel of the master bath. A floor to ceiling room divider is a fun, striking way to add storage to a room that suffers from too much floor space and not enough closet space. Admit it, you’ve always known your shoes were art. Lastly, one room that can never have too much storage is the kitchen. Luckily there are so many clever and beautiful ways to add additional storage for just about any need. 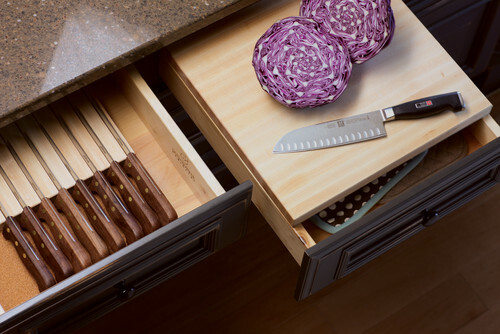 Pair a slotted knife drawer with a pull out cutting board for prep space when you need without sacrificing counter space. 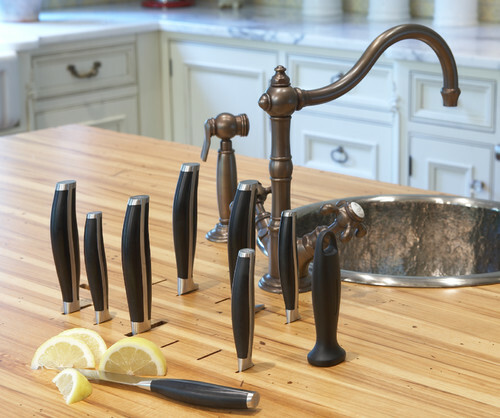 Or, turn the knives themselves into a visual detail with slotted storage built into the countertop itself. Wine refrigerator overflowing? Consider a pull out drawer for extra bottles. Ready to upgrade to customized storage solutions that fit your tastes? BoldForm Designs would love to design the perfect solution for you. Contact us here. 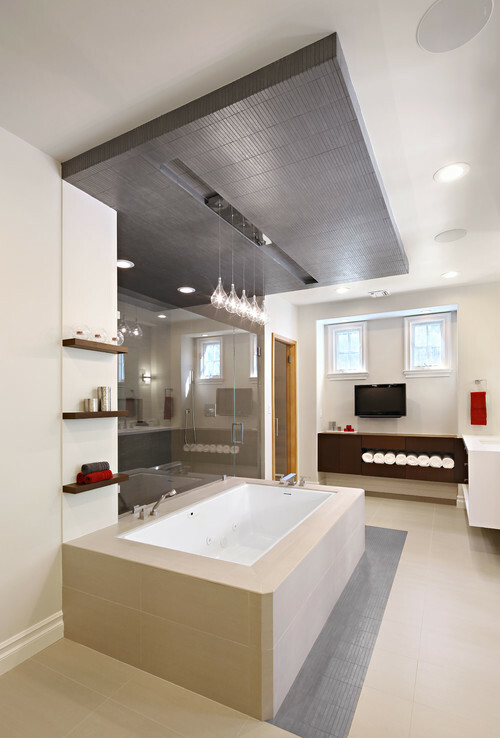 Interior Design interior design, interior design atlanta, modern interior design, storage ideas. permalink.